Variable foci. A few weeks ago, we discussed the recent gene finding in Familial Partial Epilepsy with Variable Foci, a rare but puzzling familial epilepsy syndrome. DEPDC5 was identified as the culprit gene. However, the potential function of the gene product left researcher scratching their heads. 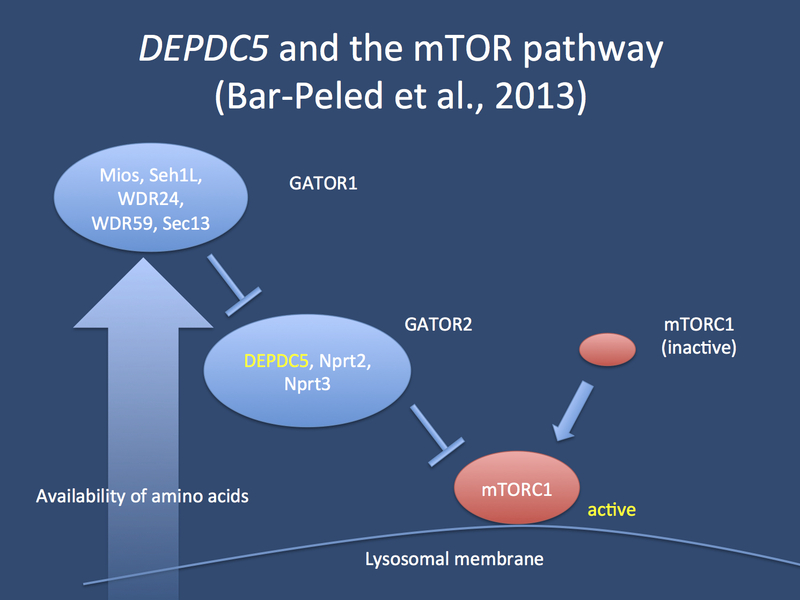 Now, a recent paper in Science suggests that DEPDC5 might interact with the mTOR pathway, the master regulator of growth. Should we reconsider the role of the mTOR pathway in genetic focal epilepsies? From TSC to DEPDC5. The Tuberous Sclerosis Complex (TSC) is a genetic syndrome affecting both the skin and the Central Nervous System. The name of the disease stems from so-called tubers, non-malignant tumors in the CNS, that can be highly epileptogenic. TSC is the single most common cause of West Syndrome. The genetic syndrome of TSC is caused by mutations in the TSC1 and TSC2 genes. Their gene products inhibit the so-called mTOR pathway and the lack of inhibition and resulting uncontrolled growth is the molecular basis of TSC. The mTOR pathway appears to be particularly prominent in brain malformations and germline or somatic mutations in other genes such as STRADA, PIK3CA or AKT3 are known to results in brain malformations. Now, DEPDC5 appears to play a role in this pathways, as well. Modulation of the mTOR pathway through the GATOR1 and GATOR2 complex. Both complexes mediate the negative feedback of amino acid starvation to the mTOR complex 1. If DEPDC5 function is impaired, the cell does not know when to stop growing in response to amino acid starvation. Starvation. Bar-Peled and colleagues looked at negative regulators of the mTOR complex 1 (mTORC1) in response to starvation with amino acids. During cell growth, the lack of available amino acids, usually sensed in the lysosome, is a strong cue to stop growing and mTORC1 is subsequently switched off. Using a set of experiments in cells lines, the authors identified the so-called GATOR complex as the mediator of this negative feedback loop. If one or more components of the complex are missing or inactivated, cell growth is resistant to amino acid starvation, i.e. cell growth continues. The DEPDC5 protein was found to be one of the components of the GATOR complex. The authors further show that these mechanisms are out of balance in several cancer cell lines, suggesting the uncoupling mTORC1 from the negative feedback of amino acid starvation might be a mechanism of tumors to grow. Interestingly, this disrupted feedback could be partially rescued by rapamycin, an mTOR inhibitor. TSC and focal epilepsy. There is at least a single report of relatively mild forms of TSC due to a mutation in TSC2 that results in a mild familial focal epilepsy. Accordingly, it is tempting to see the resemblance to the phenotype caused by DEPDC5 mutations. Future research will show whether dysregulation of the mTOR pathway is the pathogenic mechanism of DEPDC5 mutations in focal epilepsies. This question has some relevance since mutations in DEPDC5 appear to be a relatively common cause of familial focal epilepsies. In these epilepsies, it would also be of interest to see whether rapamycin might potentially work as an antiepileptic drug. This entry was posted in 2013, Familial epilepsies, Papers and tagged cell growth, DEPDC5, familial focal epilepsies, Familial Focal Epilepsy with Variable Foci, GATOR complex, mTOR, rapamycin, TSC1, TSC2, Tuberous Sclerosis Complex. Bookmark the permalink.